Katie Baker: When rising American tennis player Taylor Townsend arrived to her second-round match at the French Open earlier this May, she caught a glimpse of the scoreboard from an earlier contest involving Serena Williams on the same court. 6-2, 6-2, the result read, and Townsend thought to herself, That was fast. It was the 18-year-old Townsend’s first time playing in the main draw of a Grand Slam, and her opponent, no. 20 Alizé Cornet, was the top-seeded French woman in the draw and the darling of the Roland Garros fans. With her thundering left-handed forehand and creatively imposing volleys, Townsend won the first set. Cornet took the second, earning wild applause (and even some attempts at the wave). It was, in many ways, a contrast in style: patience versus power, baseline versus serve-and-volley, righty versus lefty, Cornet’s trim tennis-standard physique against Townsend’s broad, strong bod. Townsend went up 5-1 in the third set, but proceeded to drop the next three games, letting Cornet and her home fans back into the match. But Townsend held on, consulting a treasured notebook full of mantras and reminders during changeovers to help calm her nerves, and when Cornet hit the tape of the net during a match point baseline rally, Townsend became the youngest American woman to reach the third round at the French Open in more than a decade. She celebrated with pumped fists and a wide, infectious smile, and then, in thrilled abandon, began dancing the Nae Nae near center court. At her post-match press conference, she was asked how it felt to win on the same red clay that had hosted the day’s earlier upset of the world’s top-ranked player. Townsend, never one to mask her emotions, let her mouth drop open in surprise and fumbled for words. 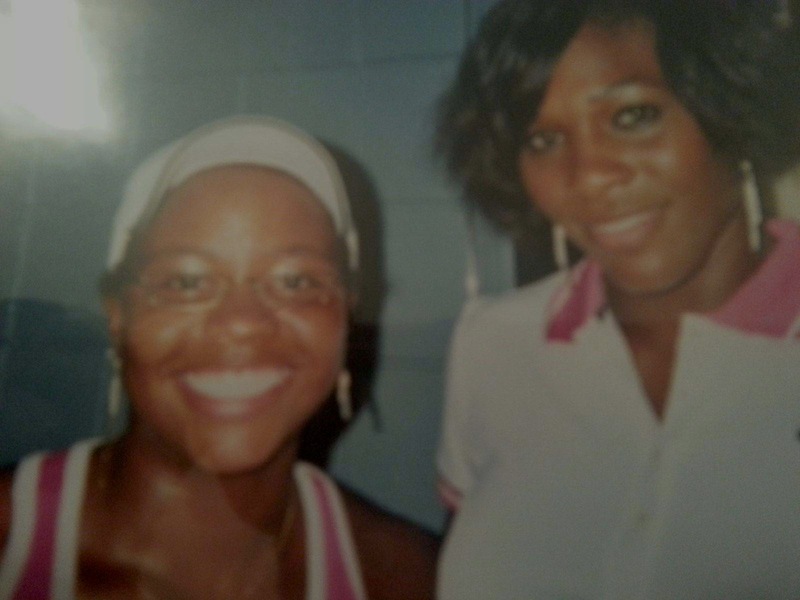 Tonight, in the opening round of her third Grand Slam tournament, Taylor Townsend will play in the 23,000-plus-seat Arthur Ashe Stadium against Serena Williams, a player she’s been compared with ever since she was a tween, playing tennis with, and against, her older (and, for a time, better) sister Symone. When Townsend was 15, Richard Williams told the New York Times that “I think she’s better than my daughters at that time. She has more variety.” When she was 16, Townsend won the Australian Open junior tournament, in both singles and doubles, added doubles titles on the Wimbledon and U.S. Open junior circuit, and was the top-ranked junior woman in the world. Also like Williams, Townsend does not have the typical tennis physique. (“I love how the DJ played ‘She Got a Donk’ when I was about to return!! !” she tweeted last month during a World Team Tennis competition.) In 2012, the USTA, which had presided over the bulk of her teenage development, announced it would not pay her travel fees to the junior U.S. Open and suggested she skip the tournament, citing what they considered to be a subpar level of conditioning. An organization in her hometown of Chicago, XS Tennis, helped put together a fundraiser to help her pay her way, and in addition to winning doubles she reached the singles quarterfinals. The highly public shaming of a still-16-year-old’s body horrified many observers, including Lindsay Davenport, whose own weight was a topic of conversation throughout her career, and Martina Navratilova, the elder stateswoman, whom Townsend says she tries to emulate with her play at the net. It also caught the attention of Zina Garrison, a former no. 3 singles player, Wimbledon runner-up, Olympic gold medalist in doubles — and recovering bulimic. “I didn’t want her to go through some of the same problems I had, and it seemed that it was heading that way,” Garrison — who will be one of 20 featured former athlete contestants on an upcoming season of The Biggest Loser — told The Wall Street Journal. Shortly after the 2012 U.S. Open, Townsend left her USTA coaches and began working with Garrison. “I always wanted to be a lefty,” Serena Williams said in a pre–U.S. Open press conference over the weekend, referring to the southpaw Townsend’s game. “They just have this weird spin that you just — no one can ever get used to it. It just” — here she tried to imitate the spin with her hand — “bounces different.” Williams also noted that, unlike most players in the women’s game, herself included, Townsend plays with an old-school, rush-the-net style that she finds refreshing. Williams likes Townsend — how can you not? — and said they “always talk and always text.” She predicted the match tonight would be “really tough.” It’s been an uneven year for Williams; while she’s going for her third straight U.S. Open championship, she also failed to make the quarterfinals in all of 2014’s three other majors. If she doesn’t win at Flushing Meadows, it would be only the third time since 2005 that she would end the year without a Grand Slam title. The player she lost to in the third round of Wimbledon? Alizé Cornet, the player Townsend beat in France. Regardless of how much you like Serena, it’s hard not to pull for Taylor Townsend on this enormous stage, to want see her pull off a win that will render discussion of her “fitness level” old news. In a CNN interview taped after her second round French Open victory, Townsend’s face visibly clouded over when she was asked, almost immediately, about the weight controversy. She handled the subject with good cheer, but you could see she was dying to talk about anything else. When the anchor closed the interview by asking what she wanted the world to know about her, Townsend’s winning smile lit right up. “I … can dance? !” she said, both a question and a declaration. Then she stood up in her Nike sweatshirt, adjusted the camera on her computer, and unabashedly danced the Nae Nae on live TV once again. Rembert Browne: My meeting with Shelia Townsend, Taylor’s mother, was a long time coming. We hadn’t seen each other since 2004, when her family moved from Chicago to Atlanta to train with Donald Young, then a phenom junior and now an ATP tour pro. (The Townsends and Youngs have long been close — Donald was the ring bearer in Shelia’s wedding.) After a decade’s worth of catch-up and a series of selfies for her Facebook page — all incredibly MOM — we talked about Taylor before heading over to watching Donald play, one day before her daughter’s matchup against Serena Williams at the U.S. Open. As we’ve been walking around, you’ve repeatedly mentioned how crazy this all is. Are you prepared to watch Taylor play Serena? Does any of this make any sense? It’s crazy. I’m still sitting back, giggling, about the fact that she’s going to play against a person that’s been her idol, a person that she and her sister [Symone, who plays tennis at Florida A&M] talked about since they were 8 and 6. Taylor, age 11, and Serena at Arthur Ashe Kids Day during the U.S. Open in 2007. Venus and Serena got a lot of black kids, especially black girls, into tennis. Would you attribute their rise to your daughters staying with the sport? I don’t think it was the big factor in them staying in the sport but it absolutely gave them the belief that they could attain whatever it was they dreamed they could do in tennis. To hear about historical figures like Arthur Ashe or Althea Gibson, you know, it’s a little different than when they can actually see themselves in the person — to feel and touch the person. So they’ve been an instrumental piece in them believing that it wasn’t impossible. Do you think it’s a good pressure that Taylor is already being thought of as a role model to the next generation, much like Serena and Venus were for her? For me, it was always about the person she and her sister turned out to be. I would always talk to them about being blessed and why they had to use what they were given in more ways than just on the court. You can have an impact to let kids know whatever are their circumstances, whether it be from the raggediest courts with grass growing in between, nets dipping in the middle — the courts that they were on — that they have people supporting them. You work hard and you don’t quit and then anything can be done. At the end of the day, even though tennis has offered our family so many opportunities, people want to know what type of person you are. You can be a great tennis player and have the worst character and then no one wants to be around you. When making the leap at a young age, the issue is often what happens once you aren’t hot anymore. What then? Right. And as a young person, and it’s just the nature of being young, you think you’re invincible. And you think it’s always going to be this way, and this becomes the norm. So what happens when that’s not the norm? And if you have people looking up to you, you really need to conduct yourself in a way that’s respectable, with integrity. We all are going to make mistakes, but as long as you’re trying to do the right thing for the right reasons, everything will work out for you. How much harder is it getting, as Taylor’s profile grows, to keep the circle tight? As a person gets more successful or people see opportunities, you’re always going to have that element of people trying to get in. So you have to be so comfortable with the people you have around them. You know that there can’t be a breach. Because if it is, one person in a circle could be an opening to so many other things. So with her being 18 — and you know they think they know everything at 18 — you’re still very young. And you don’t have all of the life experiences and wherewithal. So you need to trust what has been put in place. As her mom, I only want what’s best for her. So I’m always going to be watching and listening and evaluating what people are doing and saying to ensure that her best interests are served and not theirs. Much of what I’ve seen written about Taylor, as well as what she puts out there herself, makes her seem like a normal teenager. Or as close to normal as she can be, considering the circumstances. One of the things that was always important to me, even before all of the success in the juniors, was for her to appreciate it all and to never forget where she came from. Because that’s where your foundation is from. And I always have made it a point for her to go back, when we’re in Chicago, to where it all started. From the public parks with the raggedy courts and weeds and everything else growing in between, all the places we played, going back and letting those kids know here’s someone that came from the same places you did. And making sure that she can always go back and be just as normal as she once was. It’s something that I know is very important that we do. And even when we aren’t home, it’s us finding organizations that are disadvantaged or have minority kids so that they can see somebody that looks like them. That’s always been something that I stressed to [Taylor] and her sister. Because you can never forget. Just as high as you go up, that’s as fast as you can come down.